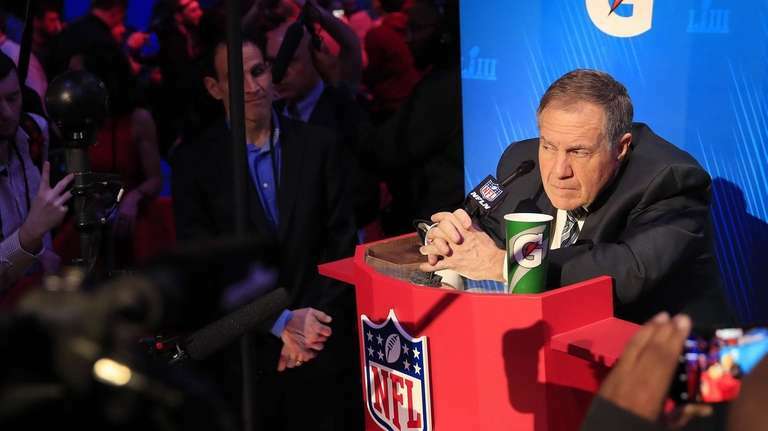 ATLANTA – Patriots coach Bill Belichick on Monday paid homage to former Giants coach Bill Parcells, who had Belichick as his defensive coordinator for the Giants’ Super Bowl victories after the 1986 and 1990 seasons. Belichick credited Parcells with introducing him to the defensive alignment that the Patriots have used through most of their 18 seasons as a Super Bowl-contending team. Belichick had the advantage of coaching Lawrence Taylor, arguably the greatest defensive player of all time, during his run with the Giants. He was asked Monday if Rams All-Pro defensive tackle Aaron Donald compares favorably with Taylor. Belichick reminisced about his first Super Bowl victory as the Giants’ defensive coordinator, a 39-20 win over the Broncos in Super Bowl XXI at the Rose Bowl.